Predatory publishing doesn’t just take advantage of authors by misrepresenting review, editorial, and fee structures. It also hinders access to the work itself, hurting the overall enterprise of research. The epidemic of predatory journals reached serious enough heights in 2016 that the Federal Trade Commission charged OMICS, one such publisher of hundreds of predatory journals, for its deceptive practices. “If it sounds too good to be true, it probably is,” says Janice Dysart, Science Librarian and creator of the Where to Publish Your Research guide. “Be wary of these email solicitations from publishers trying to get you to submit articles to their journals.” She recommends using the Think Check Submit checklist to determine whether a publisher is legitimate. 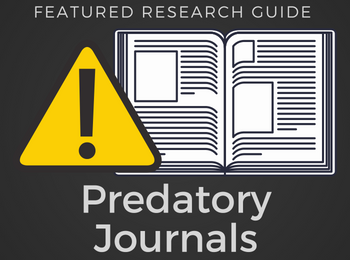 For more information on how to spot predatory journal publishers, see our Where to Publish Your Research guide or contact your subject librarian.